Black-eyed peas are a New Year's Day tradition meant to bring good luck in the new year. The most popular black-eyed peas recipe may be Hoppin’ John. 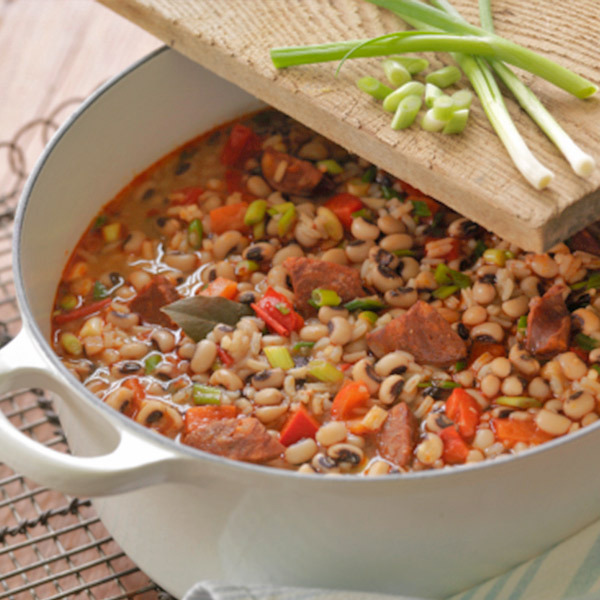 While there are countless interpretations of this traditional dish, Hallmark’s Hoppin' John recipe is a delicious “pot licker” of a soup that goes well with cornbread to mop up the juice! Featuring rice, chorizo or spicy Italian sausage and peppers, this Hoppin’ John recipe brings big flavor and plenty of good luck to your New Year's Day celebration. Soak the black-eyed peas overnight in water to cover by 2 inches. Drain well. In a large pot, combine the drained black-eyed peas, ham hock, bay leaves, garlic and water. Bring to a boil, reduce to a high simmer, partially cover and cook until the peas are almost tender, about 45 minutes. Meanwhile, prick the chorizos in several places with the tines of a fork. Fill a medium skillet with about ⅛ inch of water. Add the sausages and bring to a boil over medium-high heat. Cook the chorizos until cooked through, about 10 minutes. Set them aside and discard the cooking juices. When cool enough to handle, cut the sausages into ½ inch dice. Add the chorizos, rice and salt to the pot, re-cover and cook until the rice is tender, about 20 minutes. Stir in the scallions and bell pepper about 10 minutes before the rice is done. If desired, pull off any meat from the ham hocks and add to the pot. Discard the bay leaves.